- The Unmaking Of Elvis Presley English, Hardback, Gebunden mit Schutzumschlag, 16 x 24 cm, 766 pages - Here at last is the full, true, and mesmerizing story of Elvis Presley's last two decades, in the long-awaited second volume of Peter Guralnick's masterful two-part biography. Last Train To Memphis, the first part of Guralnick's two-volume life of Elvis Presley, was acclaimed by the 'New York Times as' a triumph of biograghical art. This concluding volume recounts the second half of Elvis' life in rich and previously unimagined detail, and confirms Guralnick's status as one of the great biographers of our time. 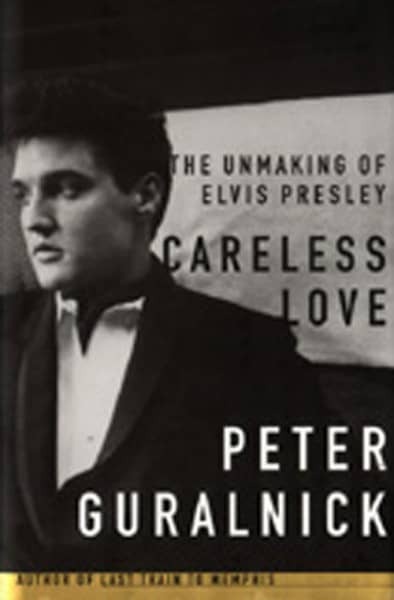 Beginning with Presley's army service in Germany in 1958 and ending with his death in Memphis in 1977, Careless Love chronicles the unraveling of the dream that once shone so brightly, homing in on the complex playing-out of Elvis' relationship with his Machiavellian manager, Colonel Tom Parker. It's a breathtaking, revelatory drama that for the first time places the events of a too-often mistold tale in a fresh, believable, and understandable context. Kundenbewertungen für "Peter Guralnick: Careless Love -"